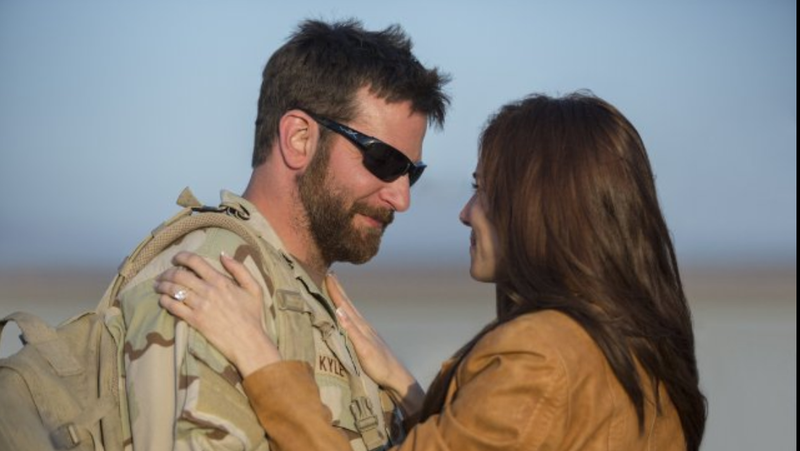 American Sniper has been out in cinemas for three weeks now and much has been written about it already. The film has done particularly good business in the States not only becoming the most successful of all of Clint Eastwood’s films, as either actor or director, but also taking the position of highest earning war film ever. Nonetheless the movie has been criticised, on both sides of the pond, for its one dimensional portrayal of the Iraqi people and many consider it to be overly Stars and Stripes waving. The movie has been nominated for Best Picture at the Oscars but hasn’t had the same recognition from the British Academy due to give out their awards this Sunday evening. There is no denying that the film fails to openly consider the morality of going abroad and killing foreigners. The enemy are all presented as evil villains apparently taking racial politics in genre films back sixty or seventy years. It seems that Clint Eastwood, the cowboy director, has reduced the Iraqi people to Red Indians. Come on though, the guy has proven himself to be an intelligent film maker before. Give him some credit. If you look for it there is evidence that the film as a whole subtly critiques narrow minded jingoism. As protagonist Chris Kyle returns for more tours of duty his justification for not being with his family is that he needs to protect and avenge his American friends and loved ones. This can only be done by killing more Arabs. While no one condemns this in the film, it still comes across as misguided. It is obvious to the audience that the people he is picking off are not directly responsible for his colleagues deaths and present no immediate danger to those at home. They are dangerous but so, with one hundred and sixty confirmed kills, is he. This is emphasised by the juxtaposition of two different scenes, one right at the beginning and one toward the end of the film. In both sequences Kyle is faced with shooting a child. This is never shown as any easy thing for him to do and there is a clear difference to how this effects him at the start and then the end of his time in the Middle East. This man may be the most lethal sniper in American history but not without cost. Months of unquestioningly assassinating strangers have taken their toll. Eastwood does want his audience to feel discomfort with how the enemy are presented and by the end that is exactly what we see his hero do too. The film has shown everything as black and white, good and evil because this is how the soldier whose story it is telling has to see it. To think anything else in his situation is untenable but I believe that rather than upholding this, the movie ultimately shows it as a fragile conceit. The point isn’t laboured. We don’t see the Iraqi people as mothers, fathers, brothers, sisters, sons and daughters because neither does Kyle but like him we don’t need to to know that taking a life, even to save others, has repercussions. As he attends the funerals of his fallen colleagues, it might not just be his allies he is mourning. This is ambiguous in the film but all the more credit to Eastwood for bravely allowing it to be so. There is something else that sets American Sniper apart from other war films and something else that audiences may see differently. Much of the story concentrates on Kyle’s wife Taya, showing us a relatable female figure untypical of the genre, but is she another hero of the war, another victim or both? I don’t know if this is deliberate or not but the film seems to, almost imperceptibly, shift its focus from Kyle’s experiences at war to those with his family. Early on his home life is a literal distraction from the drama as a tense roof top scene is interrupted to show his lengthy back story. The suspense of those opening moments (shown in the trailer) is replaced by a fifteen minute sequence in which we see him rodeo riding, courting his wife, watching the Oklahoma bombings on TV, joining the army, training hard, watching the 9/11 attacks on TV, marrying his wife and getting posted. In the first hour the film bounces back between his tours and his leave and seems to lose some momentum every time he goes home. Initially it is not as interesting when he is stateside because he is not as interested in being stateside. After a series of base camp chats and sniping montages though his time in the US draws the greater interest. There is a great scene where the two worlds come together as Kyle comes under attack while he is on the phone to Taya but ultimately the film becomes more about those left behind. It is like a serious version of those moments in Austin Powers where you see the recently dispatched henchman’s friends waiting for him to come to his own birthday party. You don’t often see the impact of war on those at home and in the end this is the real strength of the film. American Sniper is not the one dimensional war film some have said it is. Clint Eastwood has taken Chris Kyle’s memoir and respectfully turned it into a tribute to all those who give their lives in defence of their country. He shows the emotional cost of killing and the truth about being a war hero. The context may be American but the message reaches further (if you let it).